The conditions this morning when we set off were a little blustery to say the least. We were soon passing The Plough P.H. where we dined last night. We passed nb Ecky Thump on the visitor moorings, another boat from the Hudson stable. As we approached Kings Orchard Marina the wind was gusting quite strongly, I suspected our entry into the marina for services might prove tricky. As it happened getting in was wind assisted, it was getting out again that proved challenging. So we had a pump out and filled with diesel and water. The diesel price here was 65p per litre for domestic use, which we thought quite good. 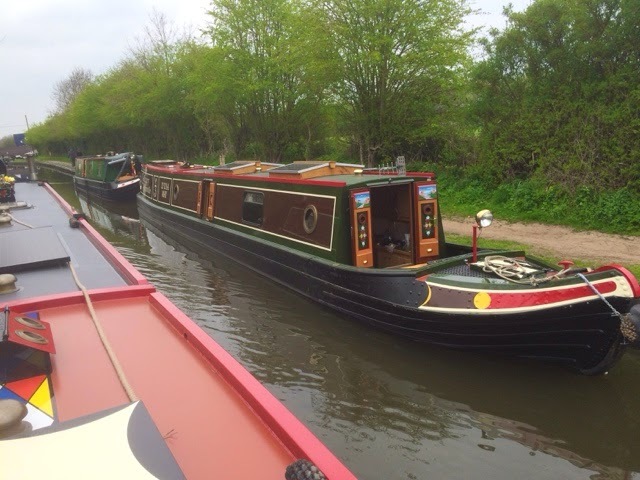 We also met the new owners of nb Clara which had now departed Glascote Basin for her new home here at Kings Orchard. 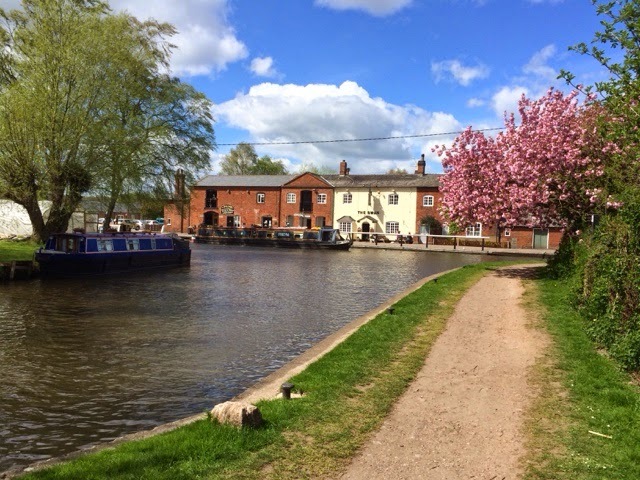 After leaving the marina it was only 2.5 miles to Fradley Junction. 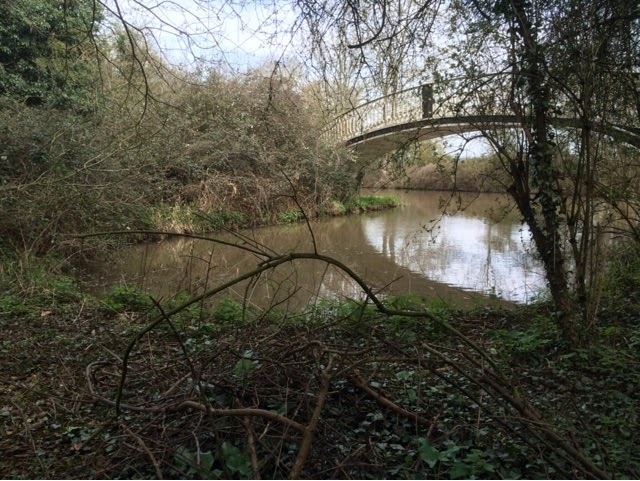 This is where the Coventry Canal (detached section) meets the Trent and Mersey Canal. As we approached the junction there were a couple of mooring spaces available and so we moored just in front of nb Wigrams Turn. After lunch we went for a walk to explore the area. Looking towards the Trent and Mersey Canal. The pub in the background is The Swan, also known as 'The Mucky Duck'. It seems to be the perfect spot for some boat watching. Beyond the junction there were not many available mooring spots so stopping where we did proved to be a good shout. 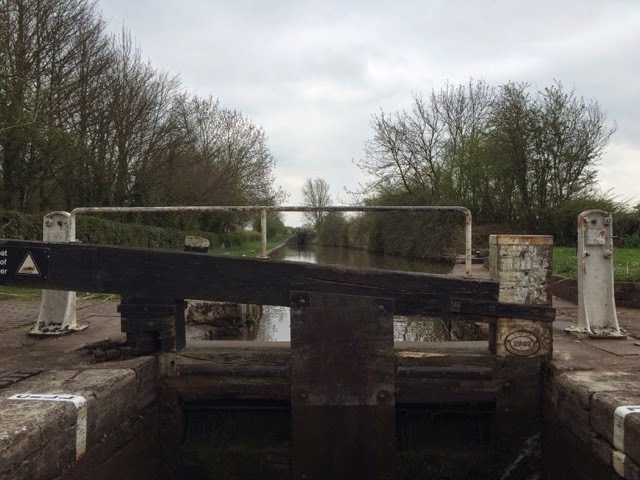 We walked down the flight of locks and noticed an unusual design of balance beam. Due to the locks being so close to the bridge, full length beams would be too long, so these are short stubby ones. I suspect they will be more awkward to open, but I am sure the crew will manage. Returning up the flight we stopped for tea and cake in a cafe, before returning to the boat and a proper catch up chat with nb Wigrams Turn. 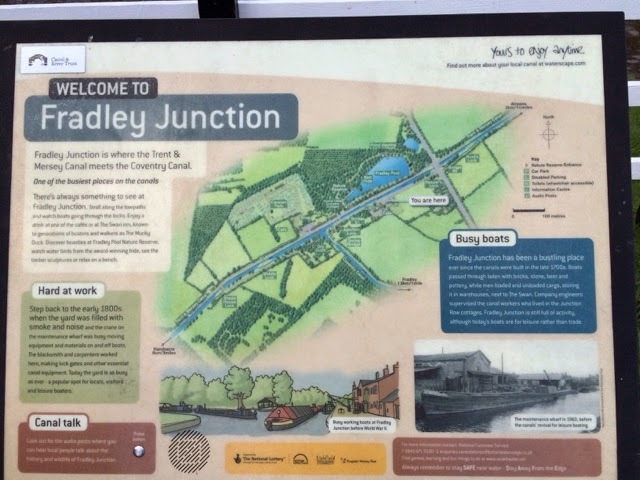 Some information on Fradley Junction. We will stay here for another day and then set off, turning left on the Trent and Mersey heading north generally towards Stafford. Well we did not make it quite as far as Huddlesford Junction, we stopped half a mile beyond the village of Whittington. Prior to reaching the village we had passed through a secluded wooded area, which also doubled up as a military firing range. It looked peaceful enough as we chugged along. The village itself appeared pleasant, and it had a small shop for us to top up supplies. Whittington, is also home to Whittington Barracks and the museum of the Staffordshire Regiment. Unfortunately one of many ancient regiments that have been cut over the years, due to government savings. Just beyond the village the canal sweeps round a long gentle bend which has secure piling so this is where we stopped. We will be staying here for a week, to allow the crew to return home for a friends birthday celebration. Although we did not reach Huddlesford junction it is only a short distance ahead. So during an exploratory walk of our local environment, we went and had a look. The junction is where the Coventry Canal (detached section) meets with the Wyrley and Essington Canal. At this end this canal only forms a short arm, which are now moorings for the Lichfield Cruising Club. The other end of this canal joins the BCN near Wolverhampton. It is currently undergoing restoration, so one day it may be a through route. 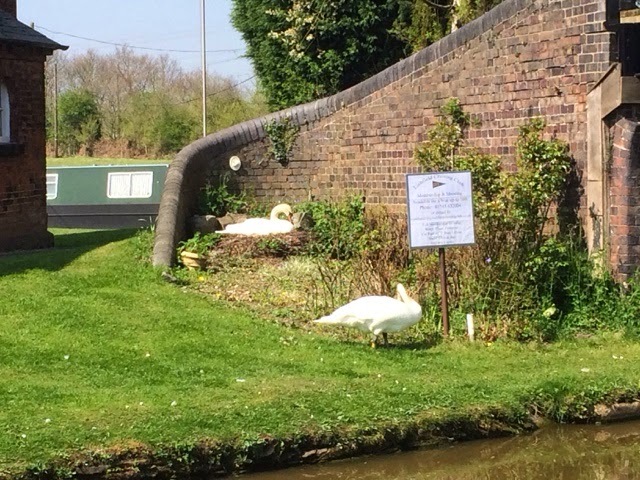 On our travels we have recently seen a number of swans building their nests, some of them have been in what could only be described as rubbish tips. This pair however, seem to have found the perfect sunny spot. This is right on the junction by the cruising club moorings. There is as you would expect a pub, The Plough and after having lunch there we decided that when the crew returns after the weekend, we will have an evening meal on the Monday to save cooking, and support local business. The past few days the weather has been warm and sunny so some outdoor chores have been completed. The boat has had a wash and the stove has been cleaned out. The flue needed a good sweep, I was surprised how much the soot had narrowed the flue diameter. With all this sunny weather the solar panel has been performing well. On good days it is producing nearly 100 amp hours into the batteries. This means we can now survive four days, without having to run the engine for charging our domestic battery bank. Today we were joined by new neighbours and whilst outside chatting with them, a Hudson boat, Wigrams Turn passed by. 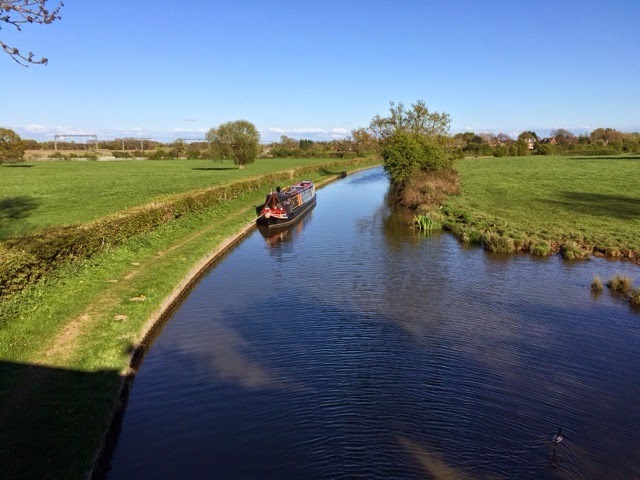 As we are soon to be heading the same way, we will probably meet up with them again at Fradley Junction tomorrow, or Tixall Wide at the weekend. Last night under a clear sky the temperature dropped quite a bit, so this morning we woke to a heavy mist hanging over the canal, and frost on the ground. We set off just before 10 am, the sun was doing its best to break through. We made good progress to Glascote, on the edge of Tamworth. On the approach to Glascote top lock we moored up to fill with water. It was sad to see what was a busy bustling boatyard now laying quite and nearly empty. Passing the entrance to Glascote Basin where Achernar was built. Nb Clara - probably the last Hudson Boat to be completed. Glascote locks are renowned for filling slowly, so it was about 25 mins before we were through the pair. Once past the entrance to Glascote Basin we were travelling on new water, for us and the boat. A mile beyond the locks we entered Fazeley Junction. This is where the Coventry Canal joins with the Birmingham and Fazeley Canal. Left is towards Birmingham, and right, the way we were going is towards the Trent and Mersey Canal at Fradley. Straight on for us towards Fradley. The route into Birmingham City Centre. We were planning to moor up just beyond the junction but it was quite full, and then suitable mooring spots for our fairly deep drafted boat were few and far between. In the end, we reached the village of Hopwas and decided to stop here for the day. Our decision was based partly on the fact that it is nice place, but also because we know this is the location of the Tame Otter P.H. and they do good food. So all moored up now and evening meal booked. We are on 48 hour visitor moorings here, but are only stopping one night before we head off to Huddlesford Junction some 4 miles away. As planned a little over an hour after we set off this morning we approached the top lock at Atherstone. There are 11 locks in the flight and a combination of short and longish pounds between. We stopped halfway down the flight between locks 5 and 6 in order to visit the town centre for a top up of supplies. There was a Co-op and an Aldi to choose from but the High Street was not much to speak of. 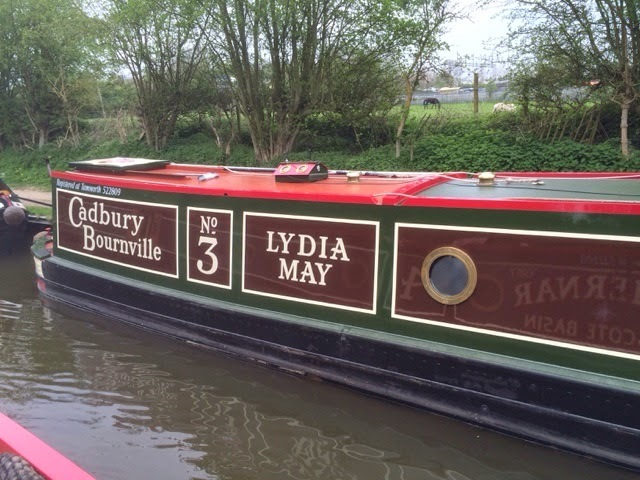 On walking back along the towpath laden with bags we met Tony from nb Lydia May. Tony's boat was possibly the second to last Hudson that was completed and we had left Glascote before it was finished so it was nice to see it all done. Tony helped the first mate with the next lock and then we said our farewells. I am sure we will meet again as we bob our way around the system. Although the day started out cloudy it was warm but by now the sun had come out so doing the remaining locks was warm work. Last but one looking back up the flight towards Atherstone. At the bottom of the locks is a service point so we pulled in to top up the water tank. This was a fast filling tap so after 15 mins we were done. It was then only a couple of hundred yards around the corner and beyond the winding hole to our planned mooring. 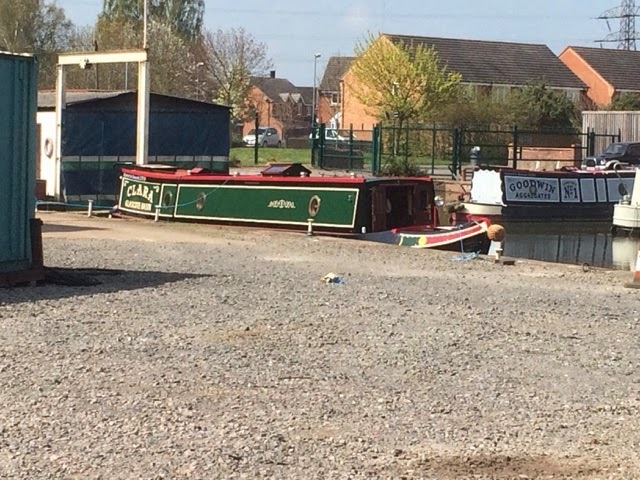 All moored up in a nice sunny spot this will now do us until Monday, when we set off for Fazeley Junction and beyond. This morning started with clear skies and bright sunshine. We set off after breakfast and passed through the stop lock. Negotiating the junction there were far less onlookers than when we did It last time. 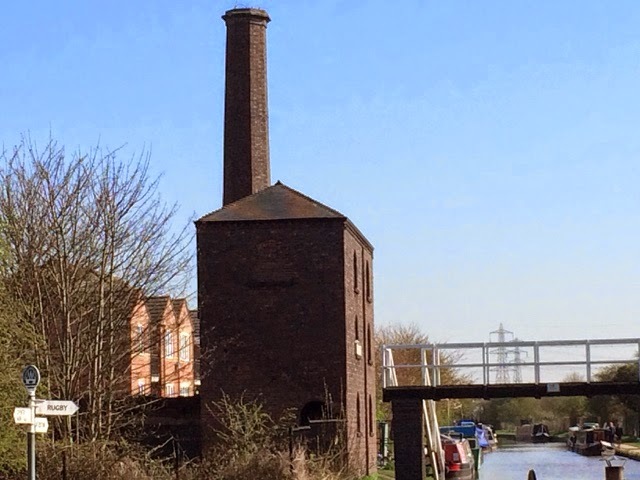 We turned right onto the Coventry Canal and passed the engine house I photographed last night. We then settled into our journey heading north towards Nuneaton. We planned to travel about 8 miles today, which will position us nicely for the Atherstone flight of 11 locks tomorrow. 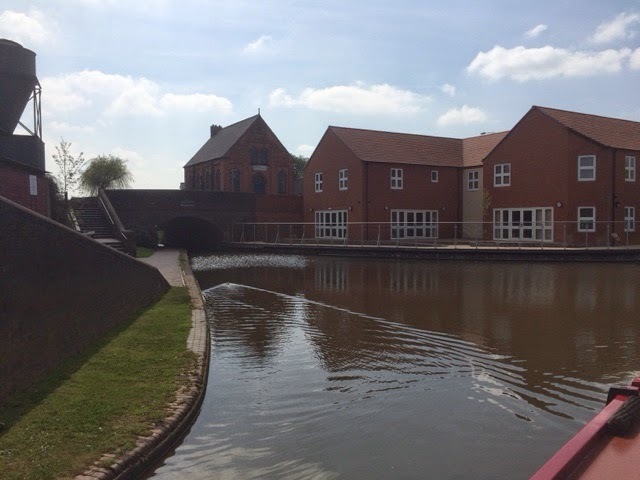 We passed Marston Junction and the Ashby Canal on the right, and then entered a short section of rural canal between the built up areas of Bedworth and Nuneaton. It took nearly an hour to travel from one side of the town to the other, then we were back into open countryside. It was during this next section I saw an old telephone pole. 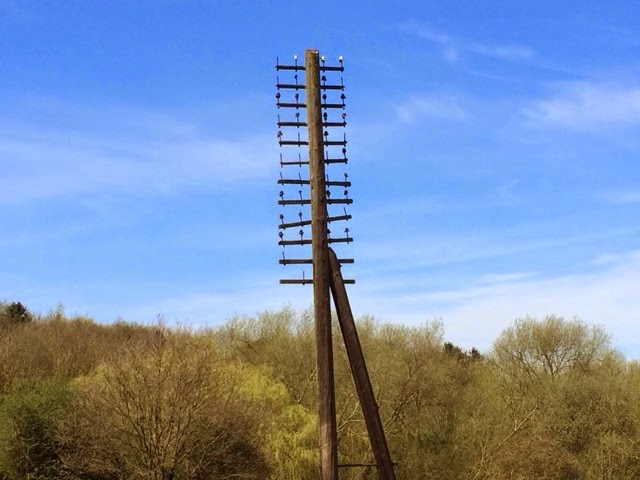 I had never seen so many terminals on one pole, especially in the middle of nowhere. Rounding a few bends we reached our planned mooring spot, just prior to Springwood Haven Marina. This is a small Marina but it has a shop and chandlers on site and is set in landscaped surroundings. This would be an ideal Marina for us but would add another 30 mins travel time to our journey to visit friends and family. It also looked full so there is probably a waiting list. After mooring the boat we walked a mile along the canal to have a look at our surroundings. It was hot work as the day had warmed up. On the way back the temptation of the ice cream signs outside the shop were too much to resist. 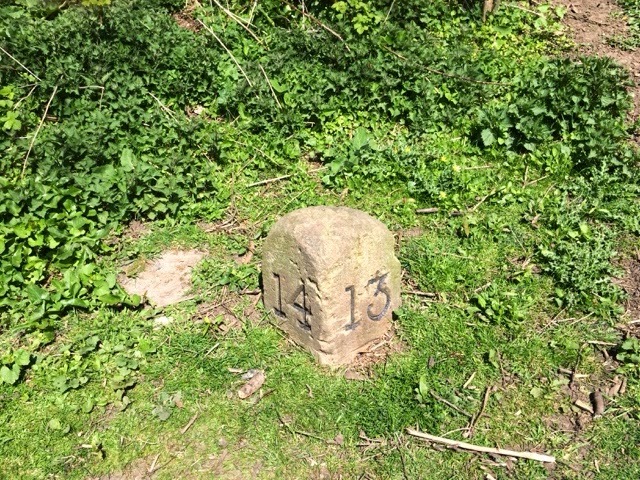 After our refreshments we returned to the boat passing a milestone showing we were 13 miles from Coventry, and 14 miles to Fazeley Junction, where the Coventry Canal branches with the Birmingham and Fazeley Canal. This is just past our boats home port of Glascote Basin. When we reach here we will be travelling on new water for us. We departed All Oak Wood at 9 am ready for our planned visit to Rose Narrowboats. We needed gas and a pump out of the holding tank. On reporting to the office I was given the news that no pump outs would be done today, this despite the fact we had arranged it, and delayed our journey by one day to accommodate them. I was therefore not impressed, especially when the excuse was that the three people there did not know how to use the machine, we even offered to do it ourselves to no avail. Moral of the story, don't rely on Rose Narrowboats again. 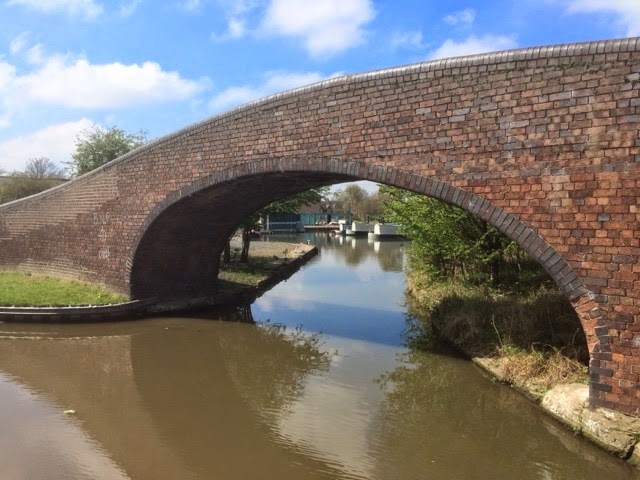 We decided that it would be better to return to Brinklow Marina and get the services done there, rather than carry on and take a chance, so that meant a three mile round trip. 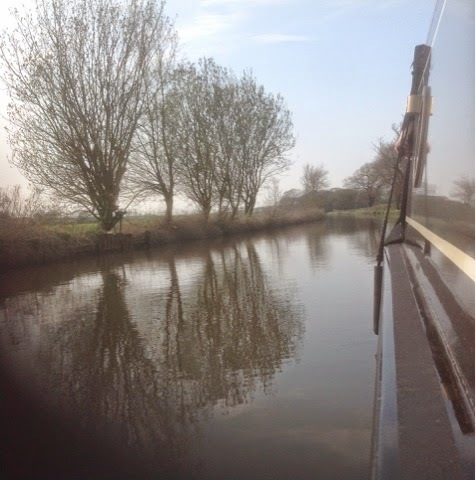 Brinklow Marina were friendly and even offered us a free night mooring, but we wanted to push on. It all worked out well as the sun, which had been a bit intermittent in the morning came out fully in the afternoon, and the temperature rose accordingly. 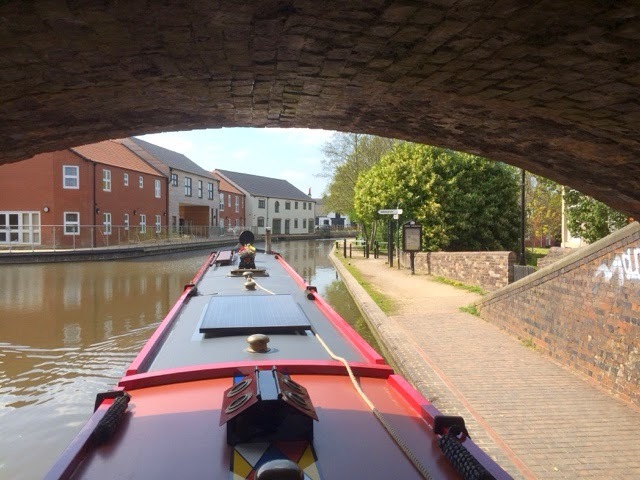 Our journey took us beneath the M6 and M69 motorways, and on arrival at Hawkesbury Junction we were able to moor about 100 yds prior to the stop lock. This junction is sometimes called Sutton Stop, named after the family that used to operate the lock in the past. 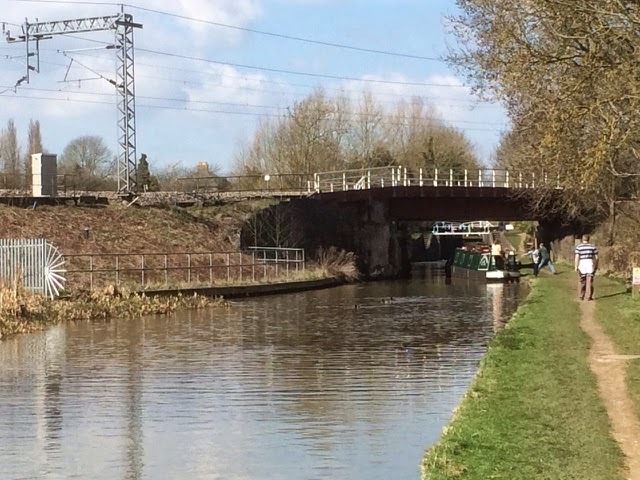 We are now at the northern end of the Oxford Canal and only a few miles from Coventry City Centre. Once we pass through the lock tomorrow we will be on the Coventry Canal. Although so close to the city it still feels rural here. One benefit is that the mobile phone is connected to 4G here so we have taken the opportunity to download some films using Three all you can eat data. Each movie is taking about 15 mins to download so by the end of the evening we should have quite a few stored on the sky box. 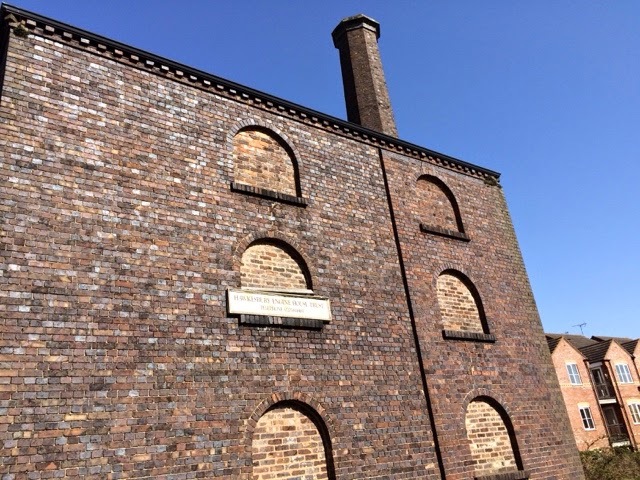 The photo above shows the silhouette of the chimney for the old engine house, which was built in the 1800s, housing an engine to pump water from deep wells into the canal. Tomorrow we turn right at the junction and head towards Nuneaton. Once the boat was secured it was off to the Greyhound PH. which has prime position at the junction for refreshments. This is our final day here. 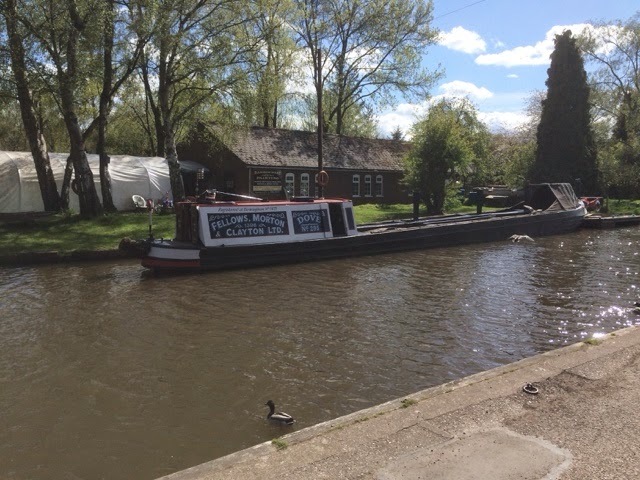 We would have moved today but we need to use the services at Rose Narrowboats tomorrow before we head off to Hawkesbury Junction. 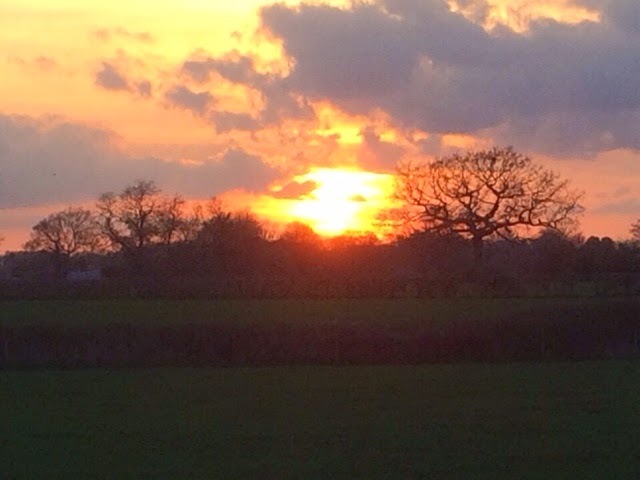 Over the last couple of days we have conducted a few walks around the local area, we also had a Sunday roast at the Bulls Head in Brinklow. Yesterday, the wind nearly blew the satellite dish off the roof, so this has now been secured temporarily with string. During the day the mooring here has slowly filled, with most boats having at least one dog. Oscar has enjoyed himself with some new friends to play with. The weather today also began to improve, which is a good omen for the next week or so, and the sunset this evening was worth a photograph. 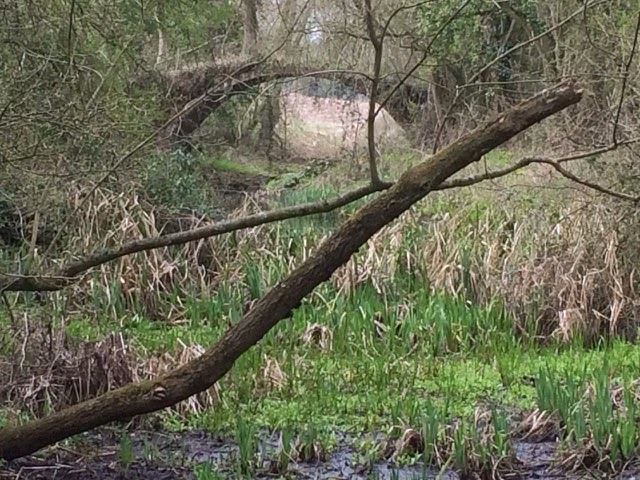 View from the canal across the fields towards Brinklow. This morning what had been a crowded spot last night had thinned out somewhat. We had to moor using pins yesterday, which can work loose as other boats pass. We now had the option of moving to where the piling was and using chains, but on checking the stakes were still secure in the ground so we are staying put. 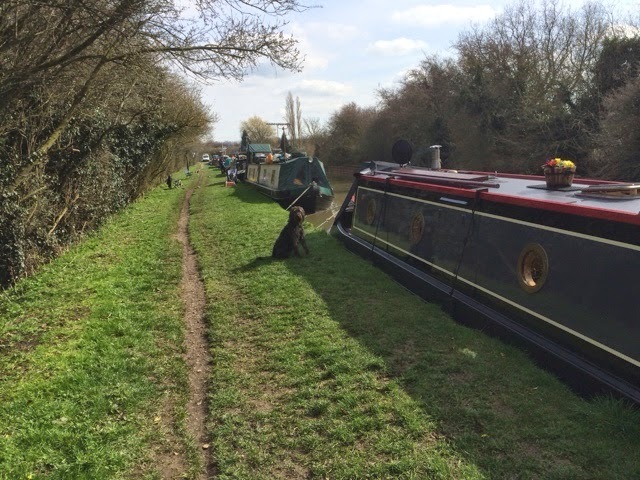 Our stroll today took us further along the Oxford Canal, we wanted to check out the boatyard services ahead. 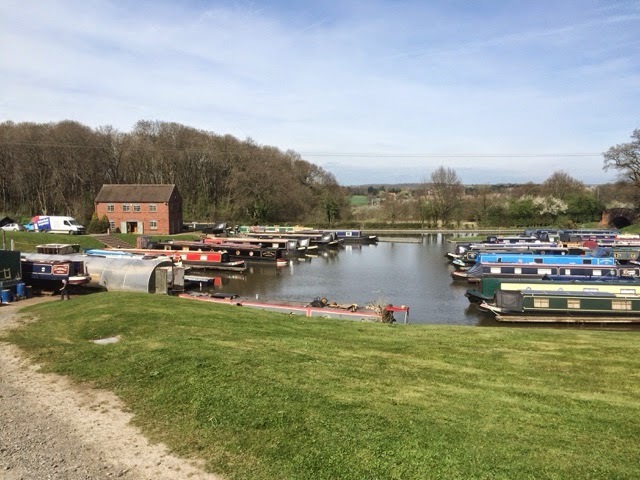 The boatyard is run by Rose Narrowboats who hire boats out as well as providing services, chandlery and repairs to passing boats. It is just as well we checked, we were going to depart on Monday, but this is a busy changeover day for the hire fleet and so they don't provide the services we would need. On Tuesday however it no problem, so that is when we will go. The walk took us through a fairly dank cutting, although the sun is starting to reach the towpath it is yet to dry out fully. It was in a particularly muddy stretch Oscar decided to charge up and down like a loony, covering both me and the first mate in slimy mud. He was not very popular for a while after that. The walk to Rose Narrowboats was about one and a half miles and roughly halfway we came across a disused canal arm that at one time would have served the village of Brinklow about a mile away. Rummaging through the woods it was possible to see the remains of the old arm and a rather dilapidated bridge through the foliage. Something else we saw today I thought was decidedly unsportsmanlike. 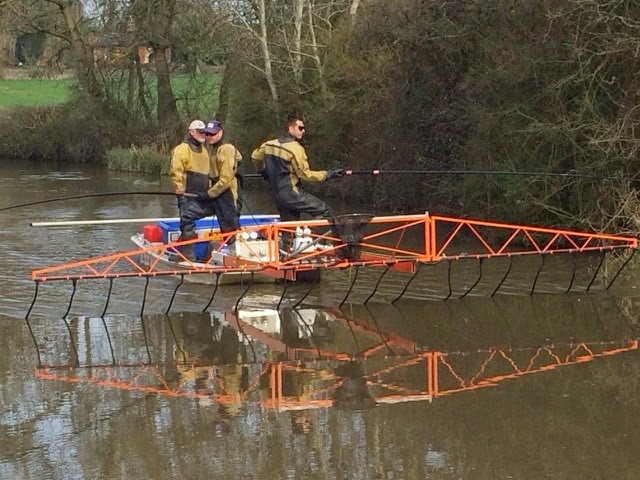 Travelling along the canal dangling probes into the water to electrically stun the fish. Apparently it is a way of capturing fish to either count them or move them elsewhere. 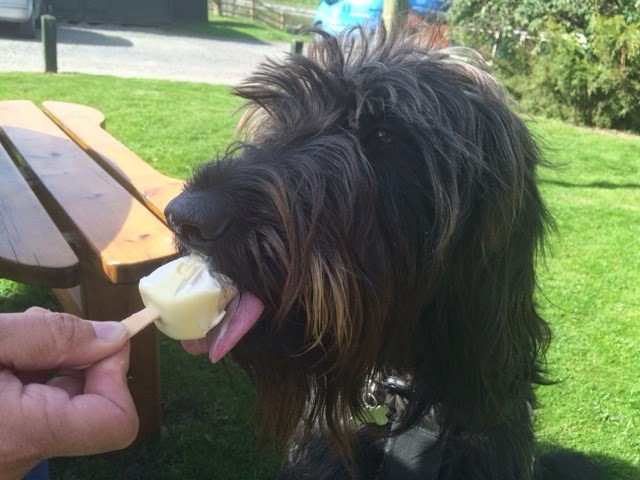 Today we decided to abstain from our regular lunchtime activity so no pub reviews in this post. 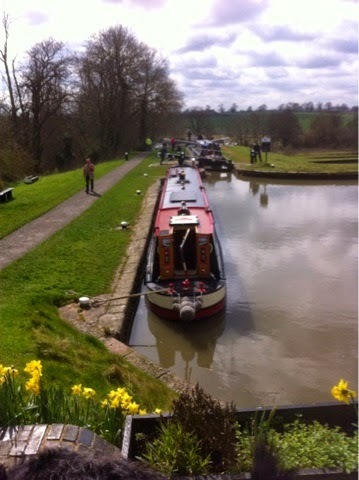 Today we left the area of Willoughby and a little over an hour later we arrived at Hillmorton Locks. There are two pairs of three locks here but currently one side has been closed due to a lock cill being damaged. The water in the pounds between the locks was also very low so we travelled very slowly through the flight. At the bottom we pulled in for water and to dispose of some rubbish. The water tap was the slowest we have encountered, taking over half an hour just to top up a quarter of our tank. Whilst waiting we were provided with some entertainment. 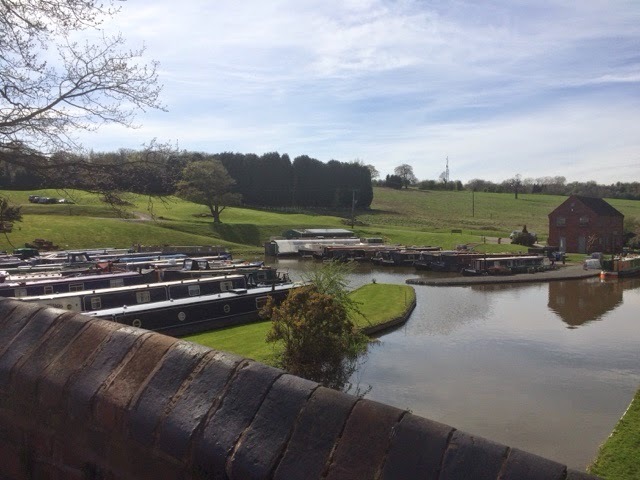 A couple of boats were moored in the winding hole by the bottom lock. Not ideal but the was still plenty of room. A boat entered the winding hole and during the process of turning proceeded to T-bone one of the moored boats at full throttle. After filling with water we continued on until we reached All Oak Wood. Whilst here we saw a boat passing, nb ploddinalong. They also write a blog which is now added to my blog list. We will probably stay here till Monday or Tuesday. We stayed put as planned today. The weather remains warm and sunny so we walked into the village a little over a mile away. 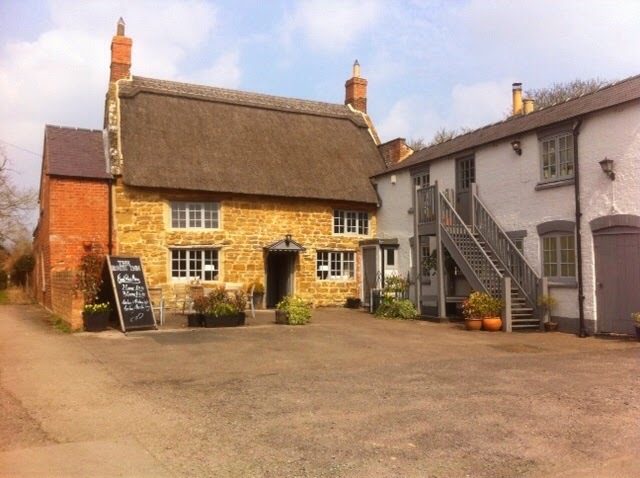 The village has nearly everything a good village should have including a thatched roofed pub, The Rose Inn. As previously mentioned and only in the interests of supporting local businesses we lunched there. 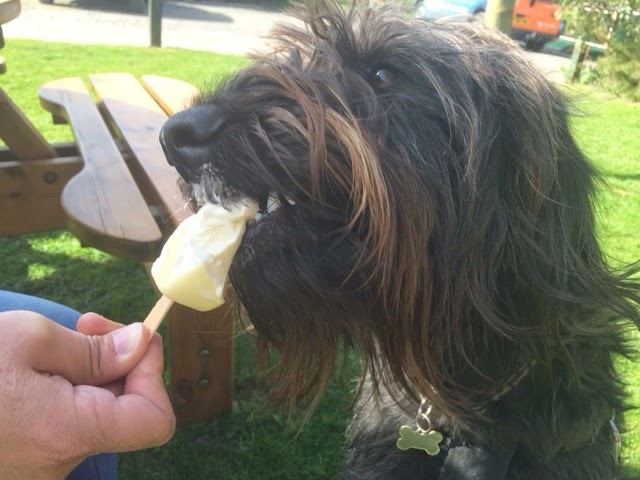 This pub unlike the one at Long Buckby is dog friendly. 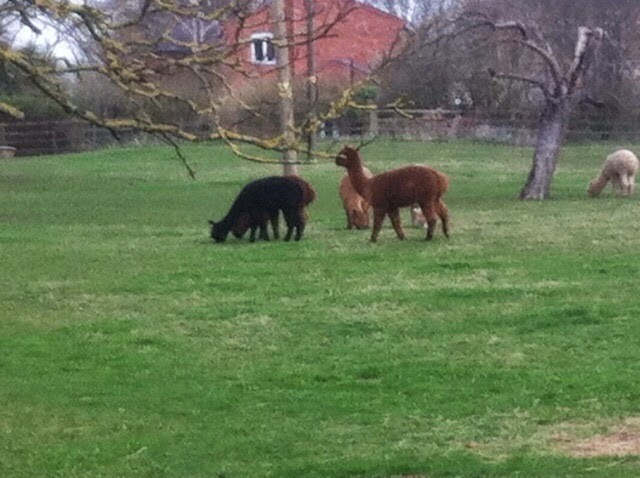 Walking back to the boat we passed a field containing some Alpacas. These seem to be popping up all over the place now. On return to the boat we saw that our exclusive mooring was not so exclusive, as we now have neighbours. Tomorrow we have 11 miles and 3 locks to navigate, so hopefully the weather will be as forecast, warm and sunny. This morning, the mist floating over the canal as the sun began to rise made getting up early worth the effort. We slipped away from our mooring at 8 am for the short 100 yards journey to the water point. We needed nearly a full tank, and it was a slow filling tap so it was 45 mins till we were off. We turned right at the junction onto the G.U. main line and saw that there was a boat ahead of us by 400 yards or so. This I hoped would be our locking partner for the wide locks at Braunston. As we travelled through Braunston tunnel, I could see the boat ahead slowing due to an oncoming boat. Then we heard the bumps. It gave me a clue what to expect, and sure enough we got bumped too. It was a Napton narrowboats hire boat, and they clearly did not realise that slowing down a bit might help. Thankfully we did not meet them at the well known kink in the tunnel so it was only a glancing blow. Emerging into the daylight we soon arrived at the locks which were set for us. 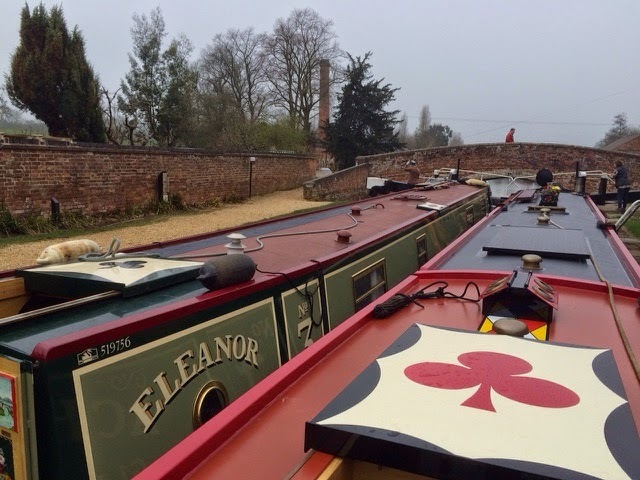 Nb Eleanor was to be our locking partner through Braunston locks. I suspect we may see them again over the next few weeks as they are also heading north towards Liverpool. Immediately after the bottom lock is a chandlers. We needed some adhesive treads for our steps so a brief stop was made. We then continued on through Braunston, breathing in deeply as we past the Gongoozerlers Rest, the smell of cooked bacon ready to tempt you. Braunston as expected was busy with not much space to moor, not that we were stopping anyway. At the junction, we turned right and joined the Oxford Canal. Leaving Braunston behind the sun broke through the clouds and we began looking for a place to stop. 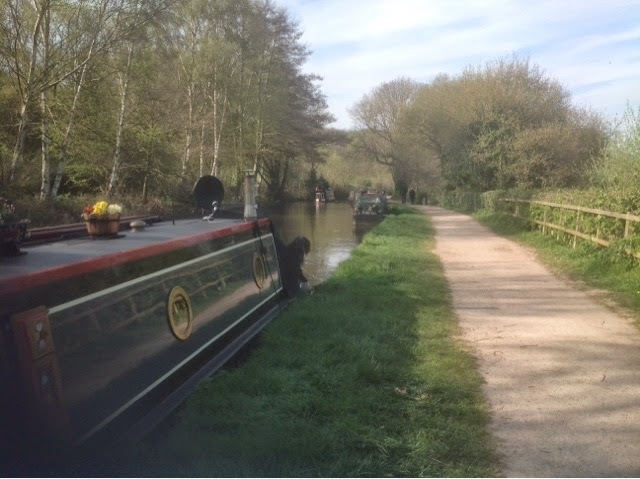 We are now moored in a nice rural spot, roughly midway between the villages of Willoughby and Barby. We will stay here till Thursday, then we head off for Hillmorton locks and All Oak Wood beyond. I might even have another go at fishing. Whilst writing this Nb Eleanor passed by so if you read this it was nice meeting you and maybe we will see you again. We have stayed at Norton Junction during the Easter weekend. On Saturday some baking was undertaken by the crew. 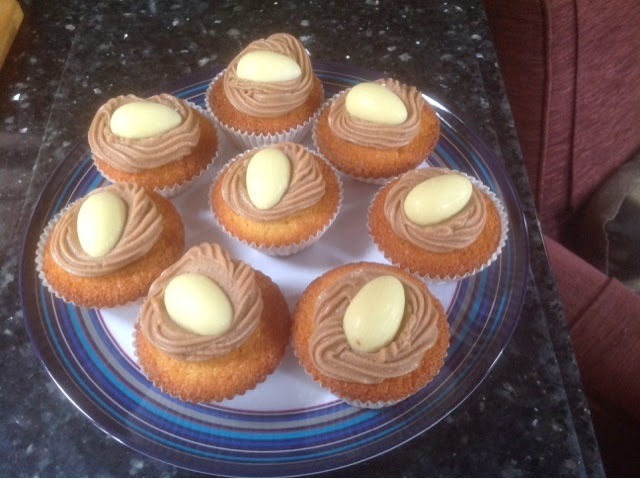 The end result were very tasty cup cakes topped off with an Easter egg. We also took a walk along the G.U. Main Line descending the Buckby flight of locks. Just beyond the top lock is a canal side shop selling canal wares. 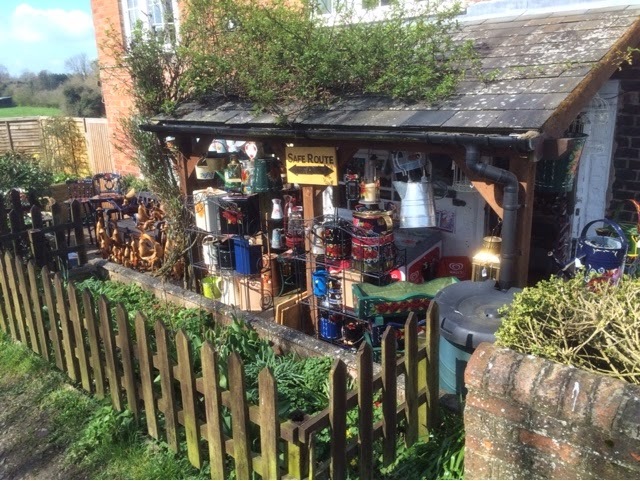 Inside the shop are a large selection of old oil lamps and a few old fashioned klaxons. I would like to change my modern electric horn for one of these, but they are not cheap, so it will have to wait a while. 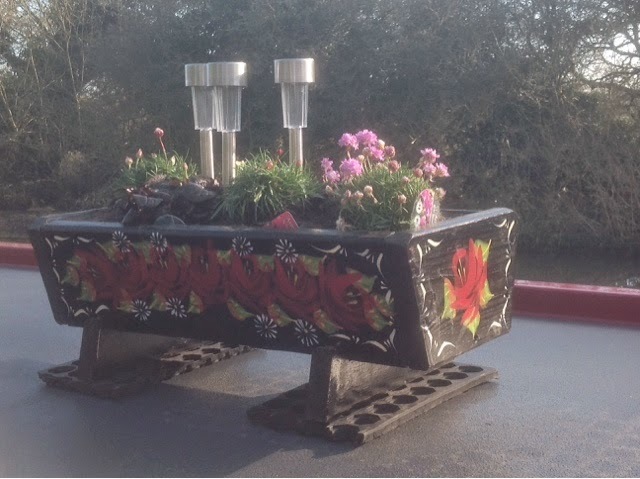 Anyway, in support of canal retailers we purchased a flower box, painted with traditional roses. On Sunday, as planned we lunched at the New Inn. 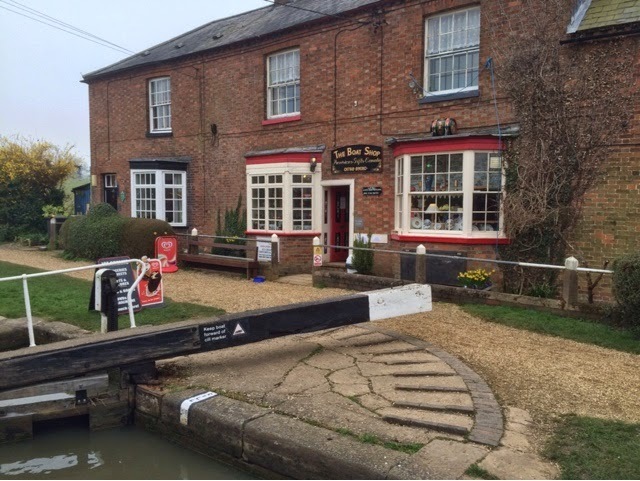 The food was excellent but unfortunately this pub is not dog friendly, so Oscar had to remain at home on the boat. Today we woke to clear skies and bright sunshine. Having purchased a flower box we now needed some flowers to put in it. There is a garden centre at the bottom of the Buckby flight, a round trip of four miles. We set off with a rucksack which was duly loaded on the return journey, with a selection of flowers and a bag of potting compost. The end result now compliments the roof of the boat. During our walk along the towpath we were enjoying the fresh air when, suddenly we began to smell strong farmyard smells. Oscars nose was twitching and on looking over the top of the hedgerow we could see why. 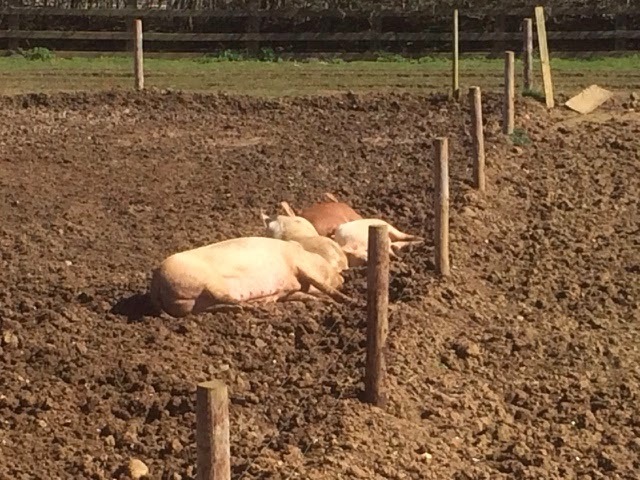 A family of pigs were wallowing in the mud enjoying the sun. This section of the country is also unique in that 2000 years of transport history, can be found running parallel within a hundred yards of each other. First, the A5 Watling Street, a Roman road. 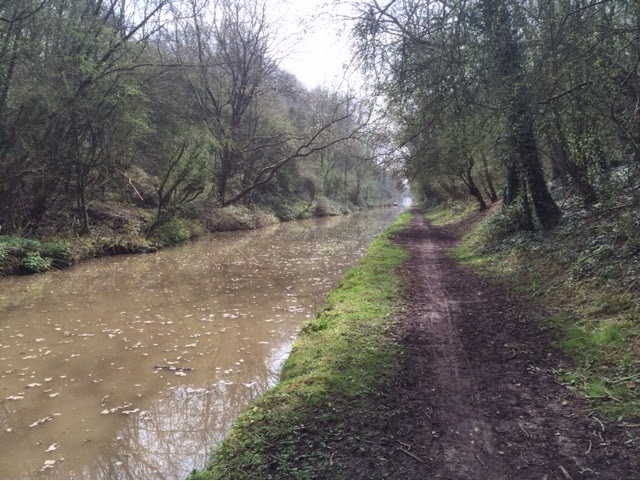 Second, the Grand Union Canal followed, closely by the Railway. This is finally topped off by the M1 motorway. The above is the railway crossing the canal. The A5 runs parallel to the left and the M1 is to the right. Tomorrow we plan to move off to just the other side of Braunston. We have six locks and a tunnel to navigate, so hopefully we will get underway around 8 am. We stayed a day longer in the marina than we had planned, due to the high winds that had been forecast. It turned out to be a good decision. 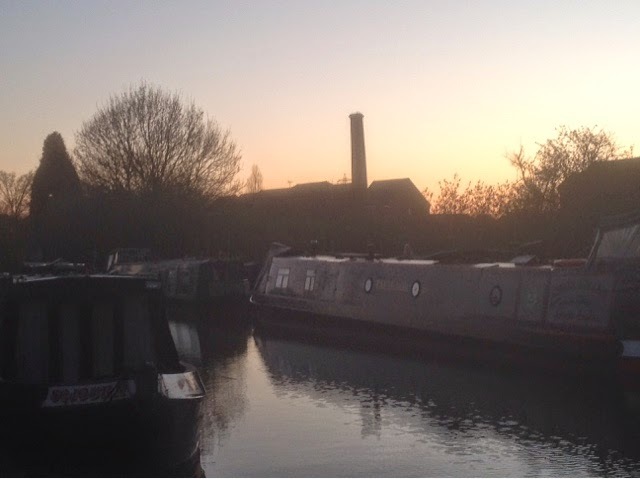 We had our winter neighbours round for a farewell curry on Wednesday evening, and then Thursday morning we set off for Norton Junction. The day was as forecast, overcast but with very little wind. We passed Crick Marina where the annual boat show is held. We won't be going this year, as we are moving further northwards. It wouldn't be the same for us either as this year there will be large hole where Hudson Boatbuilders usually had their boats. Beyond the marina was Crick Tunnel. A boat was just exiting, and I could see through to the far end that it was clear. What I could not see was that it was dripping, virtually all the way through. Obviously last time we passed it was at the end of the summer and so was fairly dry, this time the end of winter and I got a soaking. The crew I should add were inside the boat, so remained nice and dry. Emerging from the tunnel we were surprised to see the sun had come out. This had not been forecast and the day just got better. Shortly after the tunnel is Watford Locks. 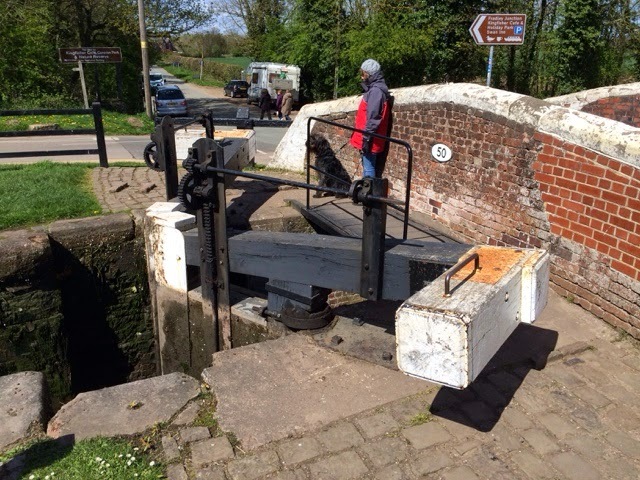 This is a staircase locks, so we checked in with the duty lock keeper and were instructed to pass through the first lock, then hold whilst boats coming up passed us. There were four to wait for. This seems to be a pattern for us as we were also held at Foxton in this way. Still it was an opportunity for a cuppa and a toasted hot cross bun. Held in the winding hole below the top lock. Once through the locks it was not much further to Norton Junction. We passed the Watford Gap Services, and began to move further away from the M1 and all the noise that it brings. 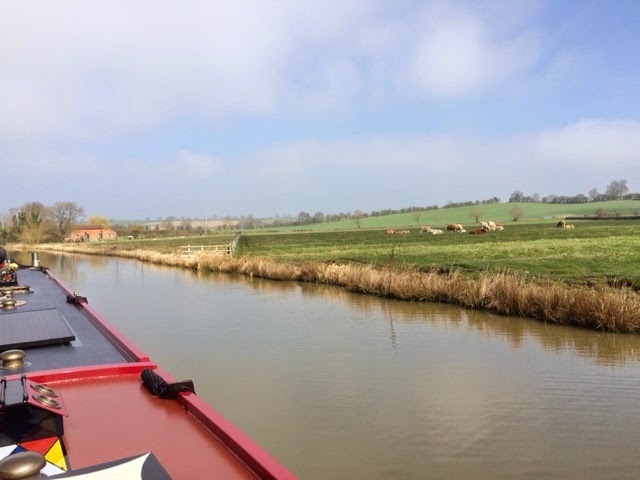 We passed numerous fields now full of lambs and as we turned the corner towards the junction with the Grand Union Canal Main Line, we saw a long line of moored boats. Fortunately there was one gap and it was just big enough. Later during our afternoon walk we saw even more boats moored up beyond the junction so it looks like we found our spot just in time. 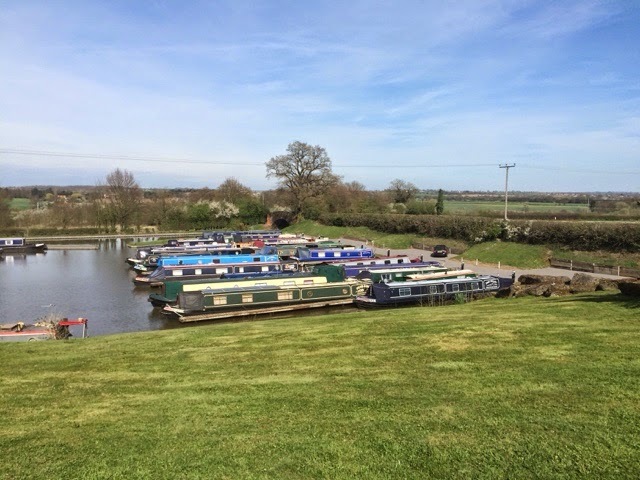 It was always going to be busy here over the Easter weekend and a large number of boats have passed us heading towards the locks. Some of these have been the old historic boats on their way to Foxton for an Easter weekend event. The museum there has been refurbished and is due for a grand reopening. We will stay here till Monday at least with Sunday lunch at the New Inn, Buckby already booked. 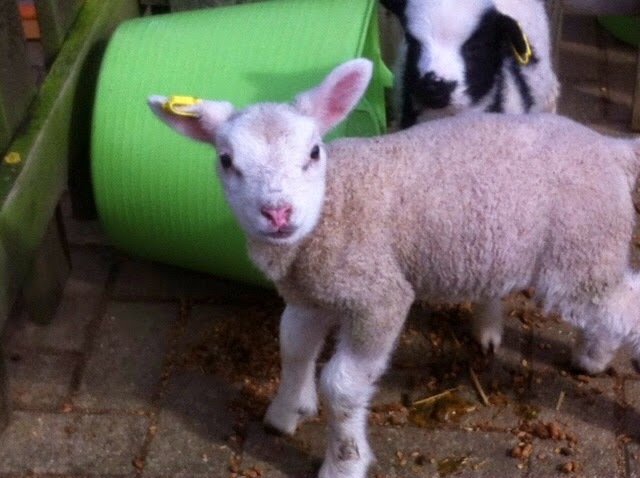 An Easter Lamb. Happy Easter.